SAN FRANCISCO Investigators are examining the cockpit interaction of two Asiana Airlines pilots who had taken on new roles before the crash of Flight 214  one of whom had seldom flown a Boeing 777 and an instructor who was on his first training flight. There were four pilots on board but the National Transportation Safety Board is focusing on the working relationship between Lee Gang-kuk, who was landing the big jet for his first time at San Francisco International Airport, and Lee Jeong-Min, who was training him. While the two men had years of aviation experience, this mission involved unfamiliar duties, and it was the first time they had flown together. The flight came to a tragic end when the airliner, which came in too low and too slow, crash-landed on Saturday, killing two passengers and injuring many others as it skittered and spun 100 feet. 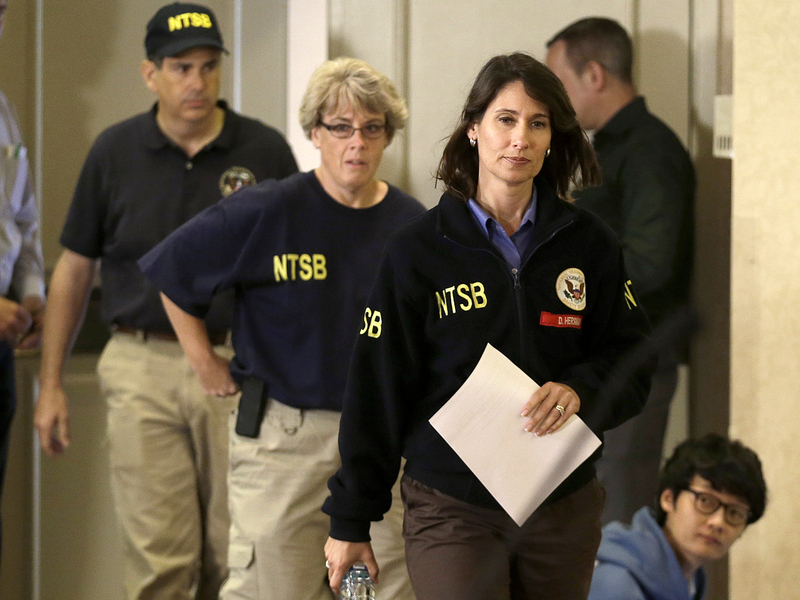 The pilots were assigned to work together through a tightly regulated system developed after several deadly crashes in the 1980s were blamed in part on inexperience in the cockpit, NTSB chairman Deborah Hersman said Wednesday. "We are certainly interested to see if there are issues where there are challenges to crew communication, if there's an authority break in where people won't challenge one another," she said. Pilots are trained to communicate their concerns openly, she said, "to make sure that a junior pilot feels comfortable challenging a senior pilot and to make sure the senior pilot welcomes feedback in a cockpit environment from all members of the crew and considers it." Hersman said the pilot trainee told investigators he was blinded by a light at about 500 feet, which would have been 34 seconds before impact and the point at which the airliner began to slow and drop precipitously. She said lasers have not been ruled out. It was unclear, however, whether the flash might have played a role in the crash. Hersman also said a third pilot in the jump seat of the cockpit told investigators he was warning them their speed was too slow as they approached the runway. Why did Asiana pilots deny flight attendants' evacuation request? And she said when the plane came to a stop, pilots told passengers to stay seated for 90 seconds while they communicated with the tower as part of a safety procedure. Hersman said this has happened after earlier accidents and was not necessarily a problem. People did not begin fleeing the aircraft until 90 seconds later when a fire was spotted outside the plane. CBS News aviation consultant Capt. Chesley Sullenberger, who piloted the "Miracle on the Hudson" jet in 2009, told "CBS Evening News" anchor Scott Pelley that the flight attendants were following their training, which is "to contact the contact the cockpit and ask for direction." "It was important to note," Sullenberger said, "that the flight attendant ... immediately saw fire on the right side and communicated that to the front and recommended evacuation so that it could take place quickly." Late Wednesday, emergency phone calls made by some of the passengers were released, revealing the chaos and confusion that unfolded Saturday. "Hi, we are at the San Francisco International Airport and we just got in a plane crash and there are a lot of people that need help," a survivor told an emergency dispatcher in one call. "There's been a crash at San Francisco airport," another caller reported. "There are people injured on the tarmac, seriously injured. There are no ambulances." The 911 dispatcher told the caller that help was on the way. Hersman stressed that while the trainee pilot was flying the plane, the instructor was ultimately responsible, and thus the way they worked together will be scrutinized. "That's what the airline needs to do, be responsible so that in the cockpit you're matching the best people, especially when you're introducing someone to a new aircraft," former NTSB Chairman James Hall said. Massachusetts Institute of Technology aeronautics professor Mary Cummings said it's common for two commercial pilots who have never worked together before to be assigned to the same flight. But she said the military tries to have crews work together more permanently. "Research would tell you that crew pairing with the same people over longer periods of time is safer," she said. "When two people fly together all the time, you get into a routine that's more efficient. You have experience communicating." Have pilots become too reliant on automation? Details emerging from Asiana pilot interviews, cockpit recorders and control-tower communications indicate that Lee Gang-kuk, who was halfway through his certification training for the Boeing 777, and his co-pilot and instructor, Lee Jeong-Min, thought the airliner's speed was being controlled by an autothrottle set for 157 mph. Inspectors found that the autothrottle had been "armed," or made ready for activation, Hersman said. But investigators are still determining whether it had been engaged. In the last two minutes, there was a lot of use of autopilot and autothrusters, and investigators are going to look into whether pilots made the appropriate commands and if they knew what they were doing, she said. When the pilots realized the plane was approaching the waterfront runway too low and too slow, they both reached for the throttle. Passengers heard a loud roar as the plane revved up in a last-minute attempt to abort the landing. The two pilots at the controls during the accident had also been in the cockpit for takeoff. Then they rested during the flight while a second pair of pilots took over. The two pairs swapped places again about 90 minutes before landing, giving the trainee a chance to fly during the more challenging approach phase. The investigation is ongoing, and Hersman cautioned against speculating about the cause. But she stressed that even if the autothrottle malfunctioned, the pilots were ultimately responsible for control of the airliner. "There are two pilots in the cockpit for a reason," she said Wednesday. "They're there to fly, to navigate, to communicate and if they're using automation a big key is to monitor." As the trainee pilot flew, she said, the instructor captain, who is ultimately responsible for flight safety, was tasked with monitoring. The third pilot was in the cockpit jump seat also to monitor the landing. Crash survivor Brian Thomson, who was returning from a martial arts competition in South Korea and walked away unscathed, said he's not concerned about the pilot's lack of experience with the airliner. "At some point you have to start at hour one, hour two. It's just natural. Everyone starts a career someway, somehow. Starts a new plane someway, somehow. They have to have training," he said. The flight originated in Shanghai and stopped over in Seoul before making the nearly 11-hour trip to San Francisco. A dozen survivors remained hospitalized Wednesday, half flight attendants, including three thrown from the airliner during the accident. Meanwhile, fire officials continued their investigation into whether one of their trucks might have run over one of the two summer camp bound Chinese teenagers, Wang Linjia and Ye Mengyuan, killed in the crash.